The Cases Rebels showed no respect for league positions as they turned league leaders Kings Lynn over in double quick time at the Oaktree Arena, claiming their biggest winning margin since stepping up to the top flight of British Speedway. Jason Doyle was yet again unbeaten at the Oaktree claiming a four ride paid maximum as all Rebels picked up a win or paid win. Wilson-Dean and Jake Allen saw the Rebels through the sixty point barrier, British champion Robert Lambert picking up his solitary win of the night as just a mere consolation for the Stars who still hold a one point lead at the head of the SGB Premiership table. knowing that the team had done such an awesome job and it is always good for others to have a stab at it. I was pretty happy with the way we went about things this evening and it is a good boost to pick up such a big win." 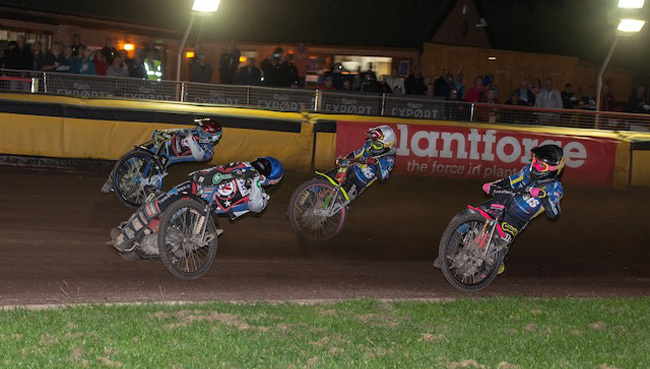 Dropping just one point from their first four heats the Rebels showed their class from the very outset, Wilson-Dean turning his fortunes around after a no-score at Leicester on Monday to finish with a paid 12 return, featuring in three maximum heats for the home side. King's Lynn pulled back four points from heat 5 through Erik Riss and Robert Lambert but then the Rebels kicked on again, building up a 20 point lead going into heat 11. A super first turn from both Jake Allen and Jack Holder took the pair clear of Lambert to guarantee the three league points, the Rebels then adding a further two maximum heat returns from the final four heats. They are set to complete their regular league programme with a visit to Belle Vue tomorrow, when they welcome back Nico Covatti who top scored for his Championship side Ipswich as they lost at Glasgow.